Belgium goalkeeper Thibaut Courtois had a moment to forget in their Euro 2020 qualifier clash with Russia on Thursday night. Youri Tielemans had given the Belgians the lead early on, but their rivals hit back just two minutes later through Denis Cheryshev. However, he won’t get many better gifts from the opposition than this one as it’s difficult to understand what Courtois is attempting to do. 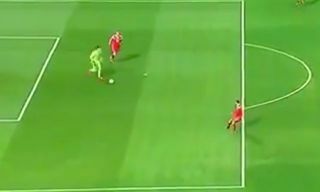 As seen in the video below, the Real Madrid star receives possession in his box and proceeds to move forward with a view of distributing it to one of his teammates. However, he continues to hang onto the ball until he completely loses his composure and panics, by which time he has been closed down and simply plays the ball to Cheryshev, who applies the finish into an empty net. With the pressure building on him at the Bernabeu, this is exactly what Courtois could have done without while on international duty this week.